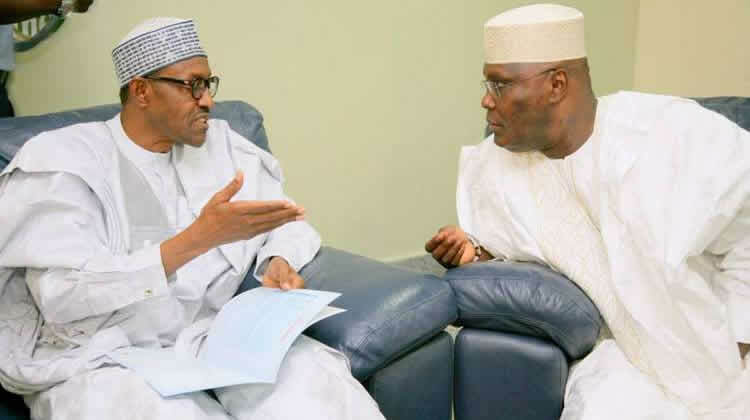 President Muhammadu Buhari of the All Progressives Congress and the presidential candidate of the Peoples Democratic Party, Atiku Abubakar, will lead other presidential candidates to sign a fresh accord to accept the outcome of the February 16 presidential election on Wednesday. A copy of the accord, titled, ‘Renewal of our pledges to peaceful elections,’ was obtained by one of our correspondents in Abuja on Sunday. Apart from Buhari and Atiku, 72 other presidential candidates are also expected to sign the pact. Recall that on December 11, 2018, the candidates expressed their commitment to free, fair and credible elections. In the new accord to be signed on Wednesday, the candidates would pledge to accept the outcome of the presidential election. Besides, they are also calling on the Independent National Electoral Commission and the security agencies to ensure strict adherence to their constitutional roles. The new accord read, “You may recall that on December 11, 2018, all of us, the presidential candidates along with our party chairmen, signed the 2019 National Peace Accord. “The substance of the accord was our commitment to free, fair and credible elections in our dear country. In the accord, we agreed to, among other things, run an issue-based campaign and pledged that our electoral campaigns would not involve any religious incitement, ethnic or tribal profiling, both by ourselves and all agents acting in our names. “Now that the campaigns have come to an end, we meet today to renew our pledge for peaceful elections. “We therefore call on all fellow citizens of our dear country, and our party supporters, to refrain from violence or any acts that may in any way jeopardise our collective vision of a free, fair and credible election. “In addition, we call on INEC and all security agencies to ensure strict adherence to their constitutional roles. We also pledge to respect the outcome of free, fair and credible elections. It was not clear on Sunday if all the candidates would appear for the signing of the new accord. Recall that the PDP had on February 6, threatened to opt out of the first accord, claiming that the APC and its members had allegedly breached the terms of the accord. The former ruling party, through its spokesman, Mr Kola Ologbondiyan, wondered why the Federal Government and the peace committee had refused to sanction the Governor of Kaduna State, Mallam Nasir El-Rufai, over his comments that were said to have threatened foreign nationals in the country. Ologbondiyan said the PDP might not sign the national peace accord, if no action was immediately taken to curb the alleged trend. Meanwhile, a former President of the United States of America, Bill Clinton and the Secretary-General of the Commonwealth, Baroness Patricia Scotland, have been named as dignitaries that will witness the signing of the National Peace Accord. It was gathered that the ex-US President would hold meetings with President Buhari and Atiku. This was contained in a statement signed by the Head of the Secretariat of the National Peace Committee (The Kukah Centre), Fr. Atta Barkindo. He said, “The National Peace Committee, mindful of the importance of peaceful elections and non-violent transfer of power, has engaged various stakeholders in preparation for the 2019 general elections. “To this end, it is pleased to announce that it has invited Bill Clinton, the 42nd President of the United States of America and Baroness Patricia Scotland, Secretary-General of the Commonwealth, to visit Nigeria from February 12 to 13, 2019 ahead of the Nigerian presidential election. “Both President Clinton and Baroness Scotland will deliver goodwill messages at the signing ceremony of the National Peace Accord which will hold at the International Conference Centre, Abuja on February 13. President Clinton will also hold meetings with President Muhammadu Buhari and former Vice-President of Nigeria, Atiku Abubakar. Meanwhile, the acting Inspector-General of Police, Mohammed Adamu, has ordered a comprehensive and water-tight security around all INEC offices and facilities nationwide. He has consequently ordered Commissioners of Police in the states and the Federal Capital Territory to protect all INEC offices and materials before, during and after the elections. The Force spokesman, Frank Mba, said in a statement in Abuja on Sunday, that Zonal Assistant Inspectors-General of Police had also been mandated to monitor the compliance level of the commands under their jurisdiction to the directive. “They are to ensure that no breach of security of any kind occurs within and around INEC facilities under their watch; the order takes immediate effect,” the statement said. Meanwhile, the IG has assured Nigerians of the readiness of the Force to deliver on its mandate of providing a safe and enabling environment for the conduct of the elections.